The Swell Season Review. The local release is without any bonus features (the Region 1 version came with numerous deleted scenes and unaired song performances) but the documentary itself is so intimate and heartfelt that it more than speaks for itself, and fans of the Once won’t to miss this understated and resonant follow up. 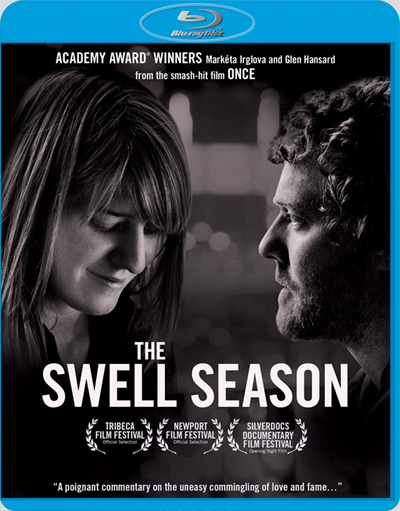 Following somewhat belatedly on the heels of the Oscar-winning 2007 indie flick Once, The Swell Season charts the subsequent journey of the film’s stars, Irish singer-songwriter Glen Hansard and Czech singer and pianist Markéta Irglová, who briefly became lovers in real life following the film’s completion. Part road movie, part musical, part love story, The Swell Season is an emotionally engaging portrayal of two talented musicians at the height of their powers. The artful black and white cinematography neatly compliments on-screen action which veers from warm and fuzzy one minute to outright pathos the next, and the cleverly layered background into Hansard and Irglová’s lives, careers and families, as well as into their burgeoning relationship and its subsequent dissolution, provides many moments of rare poignancy. Oh yes, and then there are the songs. In addition to snippets of backstage noodling (and occasional canoodling) we are treated to plenty of footage of the duet rehearsing and performing some of their most well-known numbers including, of course, the sublime ‘Falling Slowly,’ which won the 2007 Academy Award for Best Original Song. The local release is without any bonus features (the Region 1 version came with numerous deleted scenes and unaired song performances) but the documentary itself is so intimate and heartfelt that it more than speaks for itself, and fans of the Once won’t to miss this understated and resonant follow up.